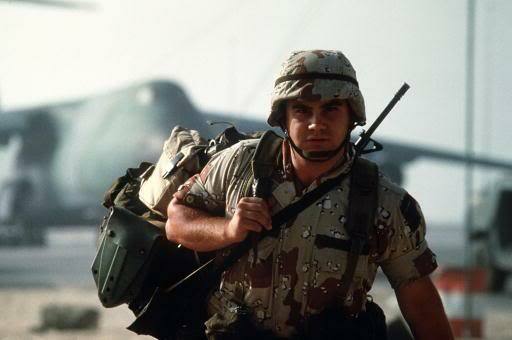 In August 1990, Operation Desert Shield began. The effort culminated five months later with the beginning of Operation Desert Storm and the liberation of Kuwait. Today, few people are aware of how much risk was involved in the initial days of the operation to defend Saudi Arabia from a potential Iraqi invasion. On August 2nd,1990 Iraqi forces invaded Kuwait. Less a week after the attack, US troops and aircraft began arriving at bases in Saudi Arabia, and naval forces were steaming towards the Persian Gulf area. Their objective was to prevent Saudi Arabia from suffering the same fate as its northern neighbor. The operation was code-named Desert Shield and five months later would convert into Operation Desert Storm. However, for the first thirty days of Desert Shield the situation was fluid. Battle hardened Iraqi forces sat on the Kuwait/Saudi border, poised south like a dagger aimed at the Saudi oil fields. The intentions of Saddam Hussein were unknown, but considering how rapidly his forces had devoured Kuwait, the very real possibility existed that Saudi Arabia was next on his list. If Iraqi forces did continue the offensive beyond Kuwait at some point in early to mid-August, all that stood in their way were the inferior military forces of Saudi Arabia, and a thin line of US paratroopers and marines supported by an expanding contingent of airpower. Even before the first Iraqi tanks entered Kuwait, US military leaders were contemplating potential military responses to the growing crisis should the need arise. The Persian Gulf region presented a myriad of obstacles. The excessive heat and dry conditions of the desert would affect soldiers and equipment alike. The US had no permanent bases in the region and its forces in theater at the time were limited to a handful of AWACS aircraft, airborne tankers and three warships on station in the Persian Gulf. The Gulf States, although westernized, had long sought to appease the Islamic fundamentalists in their nations by resisting requests by the United States to establish a permanent military presence in their land. Even more troubling was the reality that no defense treaties or plans of cooperation were in place between the US and the Gulf States. The US military had never trained to fight alongside the forces of Saudi Arabia, Qatar, Oman and the other Gulf states the way it had trained to operate with its NATO allies. America’s response to the invasion of Kuwait proved that Fahd’s faith was not misplaced. Bush and his cabinet had been reviewing options and charting a course of action for the United States since the crisis broke. Diplomatic efforts thus far were doing little to dislodge Iraq from Kuwait. Militarily, the situation was even worse. Iraq had over 100,000 soldiers on the Kuwait/Saudi border including elite Republican Guard divisions armed with high tech weapons and manned by capable soldiers led by well-trained officers. These forces were more than a match for the Saudi military. As Bush considered military intervention in the early days of August, the commander of US Central Command (CENTCOM) General H. Norman Schwarzkopf was summoned to Washington to brief the commander-in-chief and his advisers. CENTCOM’s area of responsibility was the Middle East. It was established in 1983 as an offspring of the Rapid Deployment Joint Task Force. The purpose of CENTCOM was to deploy combat ready forces to the region encompassing Southwest Asia and the Persian Gulf. As it stood, CENTCOM had no fighting units directly under its command. It took units from other major commands, as per previously laid out contingency plans, packaged and deployed them as necessary. CENTCOM had just ended its annual command post exercise code named Internal Look. The exercise scenario for 1990 had been based on the premise of an Arab nation invading its Arab neighbor and prompting a US response. Internal Look proved to be prophetic, and enabled Schwarzkopf to present a realistic, up to date plan to the President. If the United States was going to defend Saudi Arabia, the operation would be fundamentally precarious. The first ground troops to arrive would be light airborne and marine forces, highly mobile, yet equipped with limited anti-tank capabilities. Heavy maneuver forces such as mechanized infantry and armored divisions were what would be needed to halt an Iraqi attack. Under the deployment plans at the time, the cargo ships carrying the first heavy elements would not arrive in Saudi until late August. And when they arrived, secure ports were needed to offload the equipment. Most of the ports capable of accepting them were on the eastern coast of Saudi Arabia, and not very far from the Kuwait border. If fighting began, Iraqi forces could control all of the Saudi ports on the Persian Gulf before the first ship carrying US armor cleared the Strait of Hormuz. Ideally, the arrival of US forces in Saudi Arabia, albeit light forces, would deter Iraq from invading the Kingdom. However, there was no guarantee that the initial show of force would be enough to give Saddam reason to pause. Time was on Saddam’s side. If Iraqi forces crossed the border before enough US forces were in the region to successfully defend Saudi Arabia, the fight might be short and the casualties high. Bush felt the risk had to be taken. An offer of military assistance was extended to the Saudis on August 6th. King Fahd wasted no time in accepting it. He formally invited US forces into the Kingdom for ‘defensive reasons’. Operation Desert Shield was officially underway. First To Go. Paratroopers from the 82nd Airborne Division were the vanguard of Operation Desert Shield, the first US combat troops to arrive. I do believe all of the ideas you have introduced in your post. They are really convincing and will definitely work. Still, the posts are too quick for starters. May you please extend them a little from subsequent time? Thank you for the post. Absolutely. I have been planning to do that and will probably have the time later in the month, so please keep an eye out for it. Also, make sure you click the article title so that you can see the entire post. I am now not sure where you’re getting your info, but great topic. I must spend some time finding out much more or figuring out more. Thank you for magnificent info I used to be on the lookout for this info for my mission. My pleasure, I’m glad I could help out. Apologies for taking so long to respond.